Welcome to my researchblog. All posts related to my PhD research in Semantic Search for e-Discovery at the Information and Language Processing Systems group (ILPS) at the Universiteit van Amsterdam. Author dvdgrsPosted on February 5, 2018 February 5, 2018 Categories Papers, ResearchLeave a comment on “The birth of collective memories” published in JASIST! My PhD Thesis “Entities of Interest — Discovery in Digital Traces” is online! My PhD thesis, Entities of Interest — Discovery in Digital Traces is now available for download. Click on the cover below to head to graus.nu/entities-of-interest and grab your electronic copy of the little booklet that took me 4+ years to write! Author dvdgrsPosted on May 8, 2017 December 27, 2018 Categories Blog, ResearchLeave a comment on My PhD Thesis “Entities of Interest — Discovery in Digital Traces” is online! 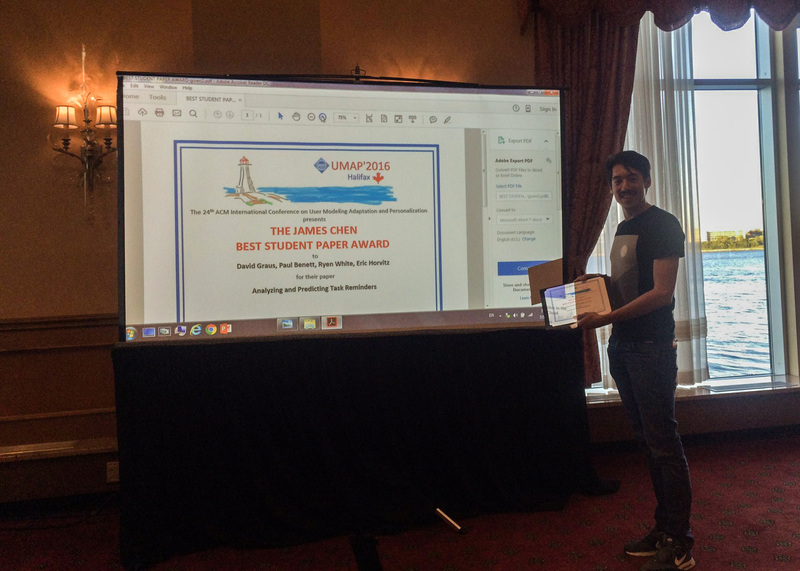 D. Graus, P. N. Bennett, R. W. White, and E. Horvitz, “Analyzing and predicting task reminders,” in The 24th conference on user modeling, adaptation and personalization, 2016.
was awarded best student paper, at UMAP 2016! Me receiving the award during the UMAP banquet dinner at the Marriott Harbourfront Hotel, Halifax. Photo by Denis Parra. Update (16 Jul): This paper was awarded the James Chen Best Student Paper Award at UMAP! Automated personal assistants such as Google Now, Microsoft Cortana, Siri, M and Echo aid users in productivity-related tasks, e.g., planning, scheduling and reminding tasks or activities. In this paper we study one such feature of Microsoft Cortana: user-created reminders. Reminders are particularly interesting as they represent the tasks that people are likely to forget. Analyzing and better understanding the nature of these tasks could prove useful in inferring the user’s availability, aid in developing systems to automatically terminate ongoing tasks, allocate time for task completion, or pro-actively suggest (follow-up) tasks. Studying things that people tend to forget has a rich history in the field of social psychology. This type of memory is called “Prospective memory” (or more poetically written: “Remembrance of Things Future“). One challenge in studying PM is that its hard to simulate in a lab study (the hammer of choice for social psychologists). For this reason, most studies of PM have been restricted to “event-based” PM, i.e., memories triggered by an event, modeled in a lab through having someone perform a mundane task, and doing a special thing upon being triggered by an event. Furthermore, the focus in these studies has largely been on retention and retrieval performance of “artificial” memories: subjects were typically given an artificial task to perform. Little is known about the type and nature of actual, real-world, “self-generated” tasks. Enter Cortana. The user logs we study in this paper represent a rich collection of real-life, actual, self-generated, time-based PM instances, collected in the wild. Studying them in aggregate allows us to better understand the type of tasks that people remind themselves about. 1. Task type taxonomy: First, we aim to identify common types of tasks that underlie reminder setting, by studying the most common reminders found in the logs. This analysis is partly data-driven, and partly qualitative; as we are interested in ‘global usage patterns,’ we extract common reminders, defined as reminders that are seen across many users, that contain a common ‘action’ or verb. We do so by identifying the top most common verb phrases (and find 52 verbs that cover ~61% of the reminders in our logs), and proceed by manually labeling them into categories. 2. 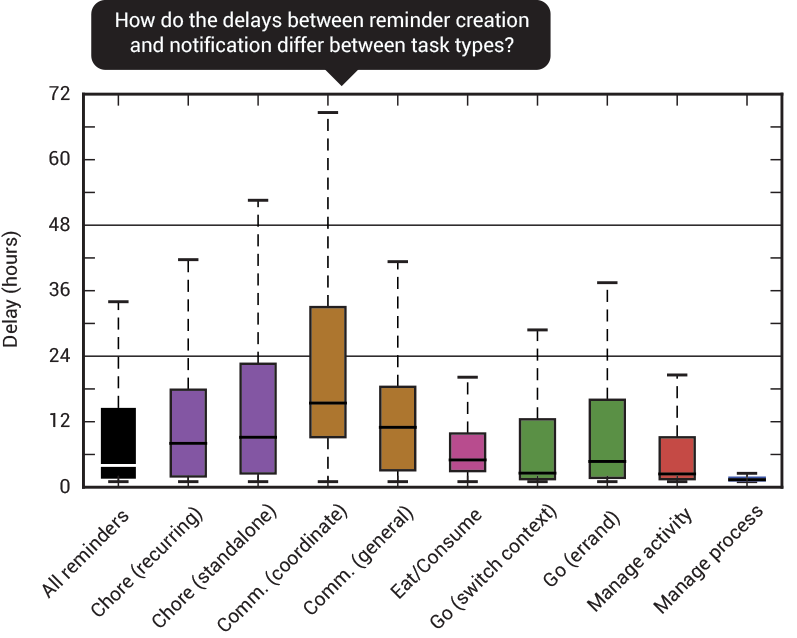 Temporal patterns: Next, we study temporal patterns of reminders, by looking at correlations between reminder creation and notification, and in temporal patterns for the terms in the reminder descriptions. We study two aspects of these temporal patterns: patterns in when we create and execute reminders (as a proxy to when people typically tend to think about/execute certain tasks), and the duration of the delay between the reminder’s creation and notification (as a proxy to how “far in advance” we tend to plan different things). 3. Predict! Finally, we show how the patterns we identify above generalize, by addressing the task of predicting the day at which a reminder is likely to trigger, given its creation time and the reminder description (i.e., terms). Understanding when people tend to perform certain tasks could be useful for better supporting users in the reminder process, including allocating time for task completion, or pro-actively suggesting reminder notification times, but also for understanding behavior at scale by looking at patterns in reminder types. We tend to plan for things (i.e., set reminders) at the end of day, and execute them (i.e., reminders trigger) throughout the day, which suggests the end of day is a natural moment for people to reflect upon the tasks that need to be carried out. The types of things we remind ourselves about are mostly short-term, immediate, tasks such as performing daily chores. People are more likely to call their mom, and email their dad. Want to know more? See the taxonomy? See more pretty plots? Look at some equations? Learn how this could improve intelligent assistants? Read the paper! D. Graus, M. Tsagkias, W. Weerkamp, E. Meij, and M. de Rijke, “Dynamic collective entity representations for entity ranking,” in Proceedings of the ninth acm international conference on web search and data mining, 2016, p. 595–604. Searching for Kendrick Lamar using his former stage-name “k.dot” (knowledge panel on the right). One challenge in giving people the entities they search for is that of vocabulary mismatch; people use many different ways to search for entities. Well-formed queries like “Kendrick Lamar” may be a large chunk, but just as well, you’ll find people searching for “k.dot,” or even more abstract/descriptive queries when users do not exactly remember the name of who they are looking for. While putting profanity in research papers is not greatly appreciated, this tweet does illustrate our point: people do refer to entities in different (and rich!) ways. The underlying idea of our method is to leverage this for free, to close the gap between the vocabulary of people, and the (formal) language of the Knowledge Base. More specifically, the idea is to enable search engines to automagically incorporate changes in search behavior for entities (“police shooting + ferguson”), and different ways in how people refer to entities (bad penguins). So how? We propose to “expand” entity descriptions by mining content from the web. I mean add words to documents to make it easier to find the documents. We collect these words from tweets, social tags, web anchors (links on webpages), and search engine queries, all of which are somehow associated with entities. 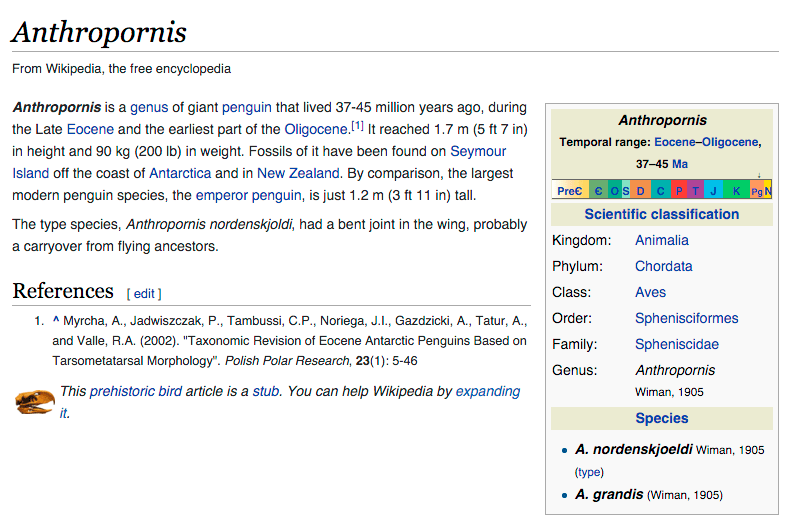 So in the case of our Anthropornis-example, the next time someone were to search for the “baddest penguin there ever was,” Anthropornis will get ranked higher. Combine a large number of different description sources. Which allows us to study differences between signals (tags, tweets, queries, web anchors). Are different sources complementary? Is there’s redundancy across sources? Which type of source is more effective? etc. As usual, I won’t go into the nitty gritty details of our experimental setup, modeling and results in this post. Read the paper for that (actually, the experimental setup details are quite nitty and gritty in this case). Let’s cut to the chase: adding external descriptions to your entity representation improves entity ranking effectiveness (badum-tss)! Furthermore, it is important to assign individual weights to the different sources, as the sources vary a lot in terms of content (tweets and queries differ in length, quality, etc.). The expansions also vary across different entities (popular entities may receive many expansions, where less popular entities may not). To balance this, we inform the ranker of the number of expansions a certain entity has received. We address all the above issues by proposing different features for our machine learning model. Finally, we show that in our dynamic scenario, it is a good idea to (periodically) retrain your ranker to re-assess these weights. What I find attractive about our method is that it’s relatively “cheap” and simple; you simply add content (= words) to your entity representation (= document) and retrieval improves! Even if you omit the fancy machine learning re-training (detailed in our paper). Anyway, for the full details, and more pretty plots like this one, do read our paper! Additionally, you can check out the slides of a talk I gave on this paper at DIR 2015, or check out the poster I presented there. Our paper “Dynamic Collective Entity Representations for Entity Ranking,” with Manos Tsagkias, Wouter Weerkamp, Edgar Meij and Maarten de Rijke was accepted at The 9th ACM International Conference on Web Search and Data Mining (WSDM2016). Read the extended one-page abstract (submitted to DIR 2015) here (PDF, 200kb). Abstract: Entity ranking, i.e., successfully positioning a relevant entity at the top of the ranking for a given query, is inherently difficult due to the potential mismatch between the entity’s description in a knowledge base, and the way people refer to the entity when searching for it. To counter this issue we propose a method for constructing dynamic collective entity representations. We collect entity descriptions from a variety of sources and combine them into a single entity representation by learning to weight the content from different sources that is associated with an entity for optimal retrieval effectiveness. Our method is able to add new descriptions in real time, and learn the best representation at set time intervals as time evolves so as to capture the dynamics in how people search entities. Incorporating dynamic description sources into dynamic collective entity representations improves retrieval effectiveness by 7% over a state-of-the-art learning to rank baseline. Periodic retraining of the ranker enables higher ranking effectiveness for dynamic collective entity representations. I will post a pre-print here soon. Update: Cool! Our paper has been selected for presentation as a long talk at the conference. Update 2: The extended abstract of this paper has been accepted for poster + oral presentation at the 14th Dutch-Belgian Information Retrieval Workshop (DIR 2015). I’ve uploaded the slides of my DIR talk here. In our paper “Recipient recommendation in enterprises using communication graphs and email content“ we study email traffic, by looking into recipient recommendation, or: given an email without recipients, can we predict to whom it should be sent? Successfully predicting this helps in understanding the underlying mechanics and structure of an email network. To model this prediction task we consider the email traffic as a network, or graph, where each unique email account (user) corresponds to a node, and edges correspond to emails sent between users (see e.g., Telecommunications network on Wikipedia). Google does recipient recommendation (in Gmail) by considering a user’s so-called egonetwork, i.e., a single user’s previously sent and received emails. When you frequently email Alan and Bob jointly, Gmail (might) suggest you to include Alan when you compose a new message to Bob. This approach only considers previous interactions between you and others (restricted to the egonetwork), and ignores signals such as the content of an email. This means that Gmail can only start recommending users once you’ve addressed at least one recipient (technically, this isn’t recipient recommendation, but rather “CC prediction”). Language modeling (LM), to estimate how strongly an email is associated to a recipient. We estimate this by generating personal language models, for each user in the network. A language model is a statistical model that estimates for a set of documents (in our case, a user’s sent and received emails) the probability of observing a word: words that you frequently use will receive high probabilities, and words that you never use receive low probabilities. In effect, this language model corresponds to a user’s “language profile”. Representing each user through language models (that represent their communication) allows us to compare users, but also do more fancy stuff which I’ll get into later. We model the task of recommending recipients as that of ranking users. Or, given a sender (you) and an email (the email you wrote) the task is to rank highest those users in the network that are most likely to receive your email. This ranking should happen in a streaming setting, where we update all models (language and network) for each new email that is being sent (so that we do not use “future emails” in predicting the recipients). This means that the network and language models change over time, and adapt to changes in language use, topics being discussed, but also the ‘distance’ between users in the network. If you don’t get this, don’t worry, in human language this reads as: the probability (P) of observing recipient R, given sender S and email E. We compute this probability for each pair of users in the network, and rank the resulting probabilities to find the most likely sender & recipient pair. Each user’s joint (incoming+outgoing) LM, which is the combination of the above two. Finally, using these different language models, we model interpersonal language models, or the communication between two users (taking all email traffic between user A and user B). See the picture below for an illustration of these different language models. , reads: probability of observing sender S given recipient R) corresponds to the closeness of sender S and candidate recipient R, in SNA terms. We explore two approaches to estimating this closeness; (1) how many times S and R co-occur in an email (i.e., are addressed together), and (2) the number of emails sent between S and R.
, reads: probability of observing recipient R) corresponds to the prior probability of observing candidate recipient R (i.e., how likely is it for R to receive any email at all?). We model this by (1) counting the number of emails R has received, and (2) the PageRank score of R (favoring ‘important’ recipients). 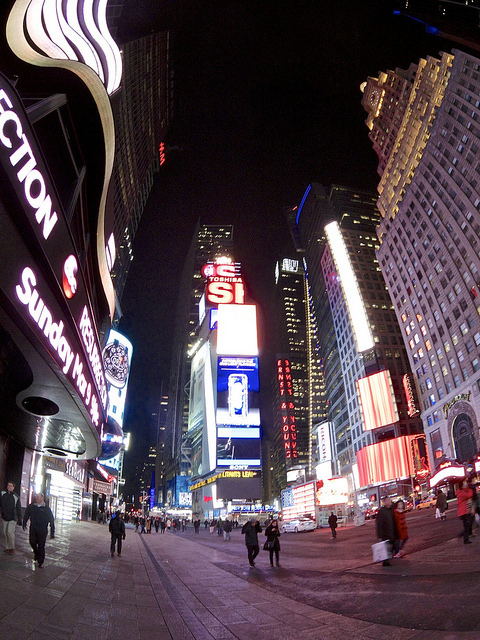 Combining both components (content & social network) is favorable. For highly active users (i.e., those that send LOTS of emails) the LM approach does comparatively worse. We argue that the reason is that highly active users have a larger number of highly ranked candidate recipients (because there are more highly scoring interpersonal LMs), making it more difficult to pick the right one. As time progresses, the SNA component does comparatively worse. We argue that this is because the network “settles in”; consider a scenario where two users mail actively with each other for months, but then one of the two users disappears from the network (e.g., is fired from/leaves the enterprise), in such a case, our SNA component will continue to highly rank this user. The LM component improves as time progresses (as it has more data to work with). The solution for the two ‘issues’ (2nd and 3rd bullet) is to incorporate time in our models, e.g. by introducing a decay in the language modeling (older emails become less important), and edge weights in the SNA components (older interactions count less than recent ones). 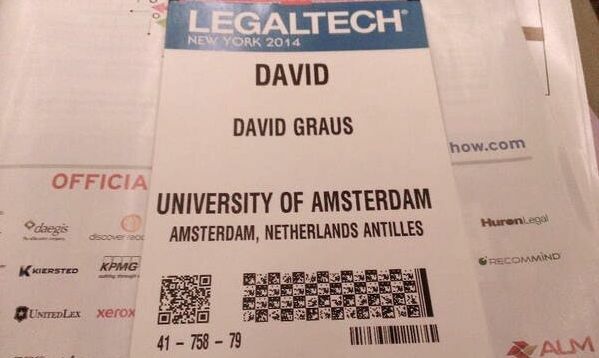 Thanks to the kind lady at the registration desk I had the unexpected honor of representing the beautiful former Carribean country of the Netherlands Antilles at LegalTech 2014, the self-proclaimed largest and most important legal technology event of the year. To get a better overview and understanding of eDiscovery (in the US). To see what people consider the ‘future’ or important topics within eDiscovery. To understand what the current state of the art is in tools and applications. Indeed, in summary, to retrieve information! (As an IR researcher does). The conference included keynotes, conference tracks, panel discussions and a huge exhibitor show where over 100 vendors of eDiscovery-related software present their products. 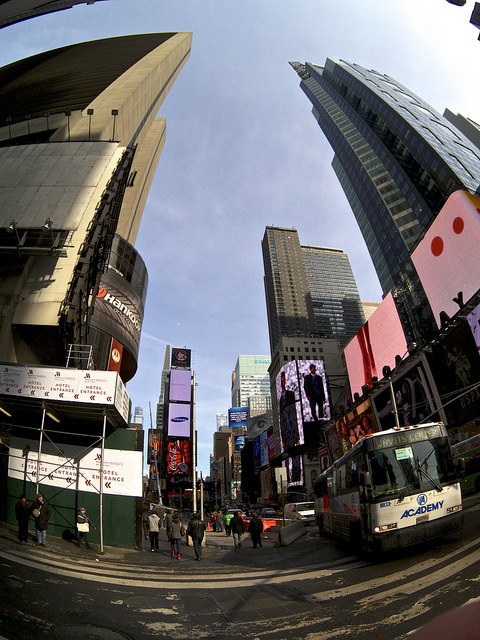 All this fits on just three floors of the beautiful Hilton Midtown Hotel in the middle of New York. To get a feel of the topics and themes, tracks titles included a.o. eDiscovery, Transforming eDiscovery, Big Data, Information Governance, Advanced IT, Technology in Practice, Technology and Trends Transforming the Legal World, Corporate Legal IT. LegalTech is a playground for attorneys and lawyers, not so much PhD students who work on information extraction and semantic search. Needless to say I was far from the typical attendant (possibly the most atypical). But LegalTech proved to be an informative and valuable crash course in eDiscovery for me (I think I can tick the boxes of all 4 of the aforementioned reasons for attending). The keynotes allowed me to get a better understanding of eDiscovery (a.o., through hearing some of the founders of the eDiscovery world), the panel discussions were very useful in getting an understanding of the open problems, challenges and future directions, and finally the trade show allowed me to get a very complete overview of what is being built and used right now in terms of eDiscovery-supporting software. I had varying success of talking to vendors about the stuff I was interested in: technology and algorithms behind tools, and choices for including or excluding certain features and functionalities. More frequently than not would an innocently nerdy question from my part be turned around into a software salespitch. To be fair, these people were here to sell, or at least show, so this is hardly unexpected. Some of the “open door” recurring themes revolved around the “man vs machine”-debate, trust in algorithms, balance in computer assisted review vs manual review, the intricacies of algorithm performance measurement, and where Moore’s law will bring the law world in 5-10 years. Highly relevant issues for attorneys, lawyers and eDiscovery vendors, but things that I take for granted, and consider the starting point (default win for algorithms!). However, it seems like this is a debate that is not yet settled in this domain, it also seems that while everyone accepts computer assisted review as the unavoidable future, it seems still unclear what this unavoidable future exactly will look like. On multiple occasions I heard video and image retrieval being mentioned as important future directions for eDiscovery (good news for some colleagues at the University of Amsterdam down the hall). Also, the challenge of privacy and data ownership in a mobile world, where enterprise and personal data are mixed and spread out across iPads, smartphones, laptops and clouds, were identified as major future hurdles. Finally, in the session titled “Have we Reached a “John Henry” Moment in Evidentiary Search?” the panelists (which included Jason Baron and Ralph Losey) touched upon using eDiscovery tools and algorithms for information governance. Currently, methods are being developed to detect, reconstruct, classify or find events of interest: after the fact. Couldn’t these be used in a predictive setting, instead of a retro-spective one; learning to predict bad stuff before it happens. Interesting stuff. What I noticed particularly at the trade show was that there was a large overlap both in tools’ functionality and features and their looks and designs. But what I found more striking is the heavy focus on metadata. The tools typically use metadata such as timestamps, authors, and document types to allow users to drill down through a dataset, filtering for time periods, keywords, authors, or a combination of all of these. Visualizations a plenty, with the most frequent ones being Google Ngrams-ish keyword histograms, and networks (graphs) of interactions between people. What was shocking for an IR/IE person like myself is that typically, once a user is done drilling down to a subset of document, he is designated to prehistoric keyword search to explore and understand the content of the set of documents. Oh no! But for someone who’s spending 4 years of his life to enabling semantic search in this domain this isn’t worrying, but rather promising! After talking to vendors I learned that plenty of them are interested in these kind of features and functionalities, so there is definitely room for innovation here. (However to be fair, whether the target users agree might be another question). I had some nice talks with the folks at CatalystSecure, who’s senior applied research scientist and former IR academic (dr. Jeremy Pickens) was the ideal companion to be unashamedly nerdy with, talking about classification performance metrics, challenges in evaluating the “whole package” of the eDiscovery process, and awesome datasets. RedOwl Analytics do some very impressive stuff with behavioural analytics, where they collect statistics for each ‘author’ in their data (such as number of emails sent and received, ‘time to respond’, number of times cc’ed), to get an ‘average baseline’ of a single dataset (enterprise), that they can use to recognize individuals who deviate from this average. The impressive part was that they were then able to map these deviations to behavioural traits (such as ‘probability of an employee leaving a company’, or on the other side of the spectrum identifying the ‘top employees’ that otherwise remain under the radar). How that works under the hood remains a mystery for me, but the type of questions they were able to answer in the demo were impressive. Recommind‘s CORE platform seems to rely heavily on topic modeling, and was able to infer topics from datasets. In doing so, Recommind shows we can indeed move beyond keyword search in a real product (and outside of academic papers ;-) ). This doesn’t come as a surprise, seeing that Recommind’s CTO dr. Jan Puzicha is of probabilistic latent semantic indexing (/analysis) fame. As I hinted at before, I’m missing some more content-heavy functionalities, e.g., (temporal) entity and relation extraction, identity normalization, maybe (multi document) summarization? Conveniently, this is exactly what me and my group are working on! I suppose the eDiscovery world just doesn’t know what they’re missing, yet ;-). Twittermania: Wordt Wikipedia straks gevuld via tweets? Our paper “Generating Pseudo-ground Truth for Predicting New Concepts in Social Streams” with Manos Tsagkias, Lars Buitinck, and Maarten de Rijke got accepted as a full paper to ECIR 2014! These entities might be unknown because they are newly surfacing (e.g. a new popstar that breaks through), or because they are so-called ‘long tail’ entities (i.e. very infrequently occurring entities). To detect these entities, we generate training data, to train a supervised named-entity recognizer and classifier (NERC). Training data is hard to come by: it is expensive to have people manually label Tweets, and you need enough of these labels to make it work. We automate this processing by using the output of an entity linker to label Tweets. The advantage is this is very cheap and easy to create a large set of training data. The disadvantage is that there might be more noise: wrong labels, or bad tweets that do not contain enough information to learn patterns to recognize the types of entities we are looking for. Watching the History channel, Hitler’s Family. Hitler hid his true family heritage, while others had to measure up to Aryan purity. When you sense yourself becoming negative, stop and consider what it would mean to apply that negative energy in the opposite direction. Sudan’s split and emergence of an independent nation has politico-strategic significance. No African watcher should ignore this. In addition, we filter Tweets based on the confidence score of the entity linker, so as not to include Tweets that contain unlikely labels. It is difficult to measure how well we do in finding entities that do not exist on Wikipedia, since we need some sort of ground truth to determine whether we did well or not. As we cannot manually check for 80.000 Tweets whether the identified entities are in or out of Wikipedia, we take a slightly theoretical approach. In brief, we take small ‘samples’ of Wikipedia: one such sample represent the “present KB”; the initial state of the KB. The samples are created by removing out X% of the Wikipedia pages (from 10% to 90% in steps of 10). We then label Tweets using the full KB (100%) to create the ground truth: this full KB represents the “future KB”. Our “present KB” then labels the Tweets it knows, and uses the Tweets it cannot link as sources for new entities. 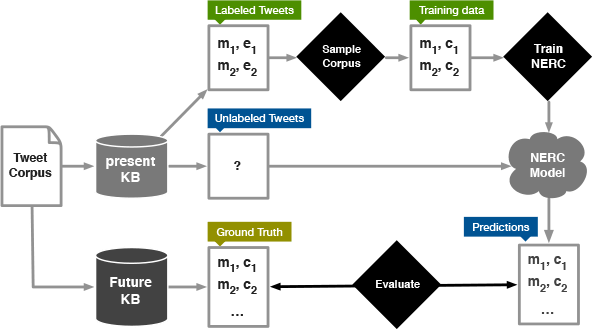 If then the NERC (trained on the Tweets labeled by the present KB) manages to identify entities in the set of “unlinkable” Tweets, we can compare the predictions to the ground truth, and measure performance. We report on standard metrics: Precision & Recall, on two levels: entity and mention level. However, I won’t go into any details here, because I encourage you to read the results and findings in the paper.